According to the calendar and the color of the leaves, this post should be about pumpkins, persimmons, Halloween, or dare I say it — Thanksgivukkah, but it’s not. It’s about banana chocolate chip muffins with roasted strawberries, lightened up with just a bit of oats and Greek yogurt. One of my very first OMG! 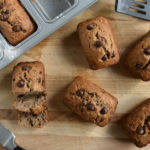 Yummy posts was about a family favorite, banana chocolate chip loaf. We still adore it just as the recipe is written. But strawberries and bananas pair up so well and who doesn’t love a strawberry dipped in chocolate? 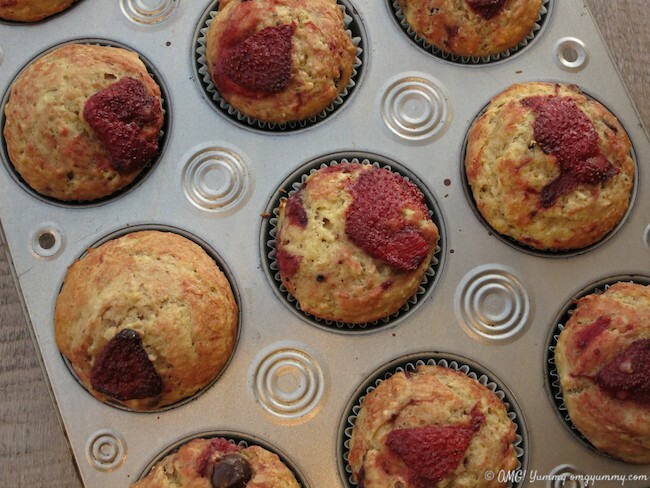 So somehow all this data, my current obsession with roasting fruit, and my great fortune of living in Northern California where strawberries are available year round all collided to create these muffins last Saturday morning. After studying several other roasted strawberry creations, I decided to roast mine with some pomegranate molasses and vanilla. But you can use maple syrup, balsamic vinegar, even honey. Then I pondered whether to use my loaf recipe or create some variation. I decided to experiment by adding some extra nutrition in the form of oats and reducing the fat content a bit. Along with looking at several cookbooks and other blog posts, I consulted this Chobani chart to figure out how to sub Greek yogurt for part of the butter. I started by roasting the strawberries. slicing them in half, putting them on a parchment lined cookie sheet, and tossing them with the pomegranate molasses and vanilla mixture, then roasted them for about 12 minutes at 375 degrees convect roast setting. At that point I was running short of time so I put them in a bowl and saved them for the next day. This worked well and is a good time management tip for this recipe. The next morning, I ground up the oats, mashed the bananas, then mixed the dry ingredients in one bowl and the wet in another. From there I mixed the dry ingredients into the wet mixture, then added in the chocolate chips and finally the drained roasted strawberries, mixing just enough to combine. 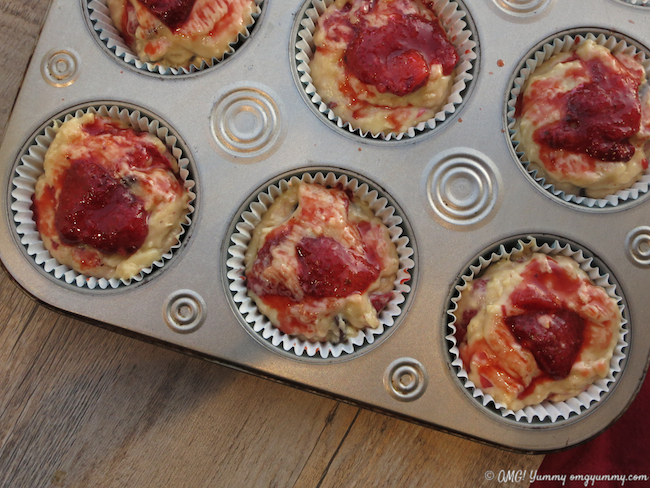 I scooped the mixture into muffin liners sprayed with just a touch of baking spray, brushed the top with the strawberry juice left from the roasted gems (great suggestion from this post), placed an extra roasted strawberry on each, and into the oven they went. Twenty minutes later they were done and ready for a pre-soccer breakfast and delivery to my niece for a late birthday brunch. A variation of my tried and true banana chocolate chip loaf, enhanced with some roasted strawberries and lightened up just a bit with some Greek yogurt and oats. Preheat oven to 375 convect roast or 400 regular bake. 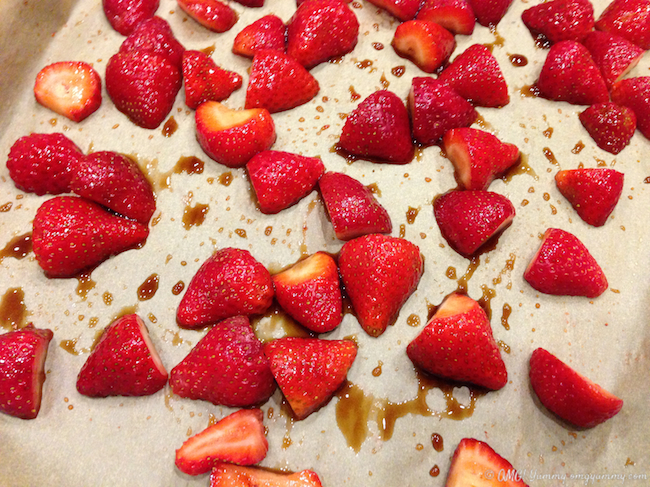 Place the cut strawberries on a parchment lined baking sheet. 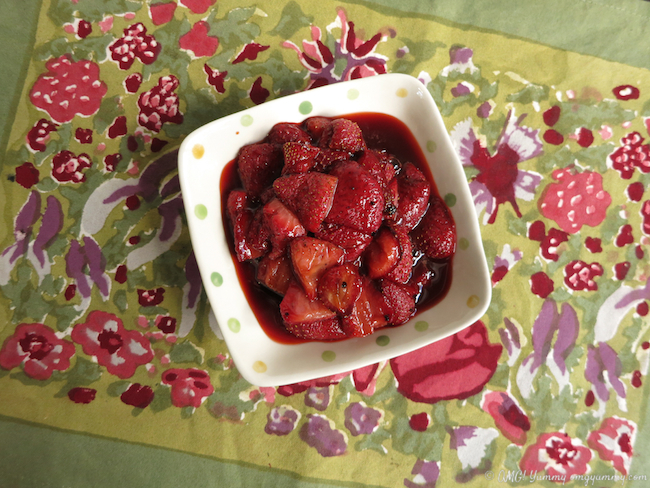 Combine the pomegranate molasses and vanilla and then pour on strawberries and toss to coat evenly. Place cookie sheet in the oven. The strawberries should be done in about 12 minutes but check at 10 minutes. If they are bubbling and just starting to break down, they are ready. You want them to start caramelizing and softening up but not to fall apart. I originally roasted mine for 13 minutes but think I could have taken them out a minute or two sooner. If not using convect, still check at 10 minutes but might take up to 15 minutes to finish. Go by sight, not just by time. Now turn the oven to 425 regular bake for the muffins. After removing the strawberries from the oven and letting them cool, put into a strainer and reserve any liquid that strains out. (Strawberries can be prepared a day ahead and stored in the fridge. 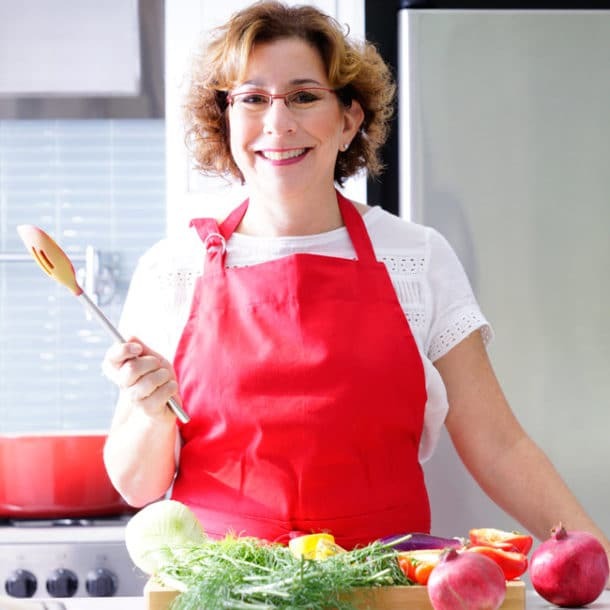 Take them out and strain while you prepare the rest of the ingredients.) They should yield about 1 cup of strawberries. Then grind the oats, mash the bananas, and measure out your chocolate chips. Be sure to check on your strawberries! Prepare your dry ingredients in a small mixing bowl. Combine the oats, flour, baking powder, baking soda, and salt. Then add in the Greek yogurt, 1 tablespoon of maple syrup, 2 eggs,1 teaspoon of vanilla extract, and the mashed bananas. Use a whisk to combine it all together or mix on medium speed in your mixer. Then add the dry flour mixture into the wet ingredients, mixing just enough to combine. Add in the chocolate chips and about 3//4 cup of strained strawberries. 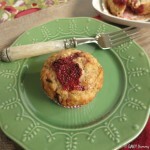 Scoop the batter into your muffin tins. 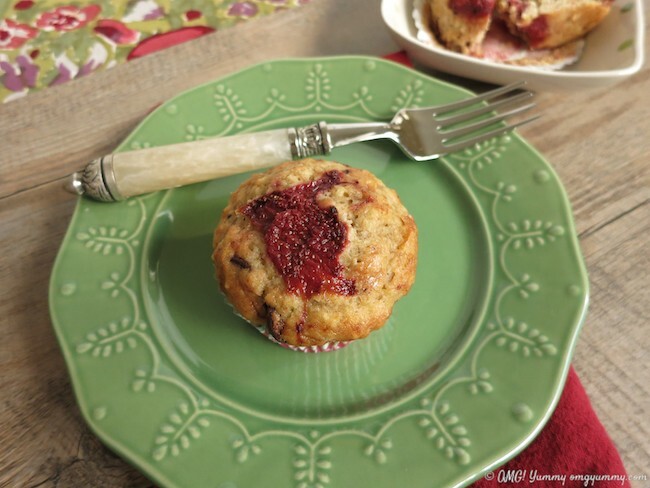 If you have strained strawberry juice and any leftover strawberries, place a roasted strawberry on top of each muffin and brush each with a bit of strawberry juice. Place in the oven at 425 regular bake for 5 minutes, then turn the temperature down to 375 and bake for 15 more minutes or until a toothpick comes out clean (except for oozy melted chocolate). 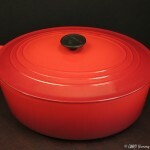 Cool on a wire rack and enjoy still warm or store in a container once cooled. Catching up on posts and dropping by for a nibble, it’s been a while since I made roasted strawberries, great inspiration to make more! And I’ve love one of these in the morning. Roasted strawberries would be lovely on ricotta soprafina with some balsamic! Thanks for stopping by for a nosh! What gorgeous muffins, Beth. I must admit I’m a little bit jealous that you grow strawberries all year round there, though equally there is something to be said about anticipation of being able to enjoy them here very, very soon. The early season ones have been in the shops for almost a month now, but they are always somewhat lacking in flavour and sweetness (though I’m sure roasting them would enhance that) – another couple of weeks I think before we have enough warm weather to start producing good berries. Yes- the season has been especially long this year and soon what we see will be likely from the south and not as sweet. Last weekend I found the most amazing strawberries by the beach at a bountiful farmer’s market. What a sweet treat for the last week of October. Hope yours come soon! Will look forward to seeing your “summer” posts while we start getting a chill! I’ll never say no to bananas, chocolate and strawberries! I love your tweaks here and the resulting muffins are very tempting. Thinking about roasted strawberries is making me hungry! I can imagine the pomegranate molasses pairs well with the berries. Lovely! 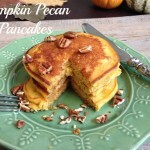 Thank you for including me in your autumn recipe round-up! I just made some delicata squash last night and am happy fall is here. Have a wonderful weekend! Doesn’t that delicata squash recipe look terrific! 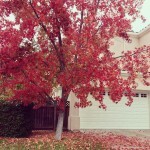 I am resisting a complete immersion into fall but I’m getting there… Have a great weekend Hannah! Any tamarind plans? I always love what you come up with! I just saw fresh, local strawberries at the fruit stand this morning. And on my drive over to Santa Cruz earlier this week I saw a flurry of harvesting in the fields near the coast. But the end of the season will be soon. I love the idea of Banana Chocolate Chip Muffins topped with intoxicating roasted strawberries! 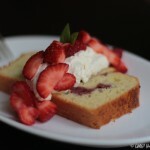 A perfect weekend treat while we can still grab a fist full of late season berries! And thank you so much for including me in your round-up! Much appreciated! I’m holding on to every last bit of summer that I can. But doing the round-up started getting me excited for fall vegetables and fruits too! Your squash looks so delectable! Loved the cupcakes Gobbled them down (i for Dad and 1 for me) with tea and coffee. Very good!!! What a clever way to update a recipe! Nice job — and thank you for including me in your round-up. I really appreciate it! You know how we love a crispy crumble around here! Wouldn’t have been a fall round-up without it!